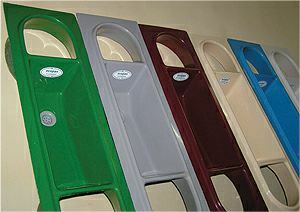 Need a Solution to High Water Table Sanitation? The Answer to these problems and more, is here! eco-solutions made the ecopan in small numbers in earlier years for its own projects and development work. Since then two training and development centres have been working with one unfortunately destroyed, along with stock, by the December 26 tsunami. A new unit working with girls from tsunami-hit areas is now set to meet increasing demand for the ecopan. Improves biomass and food production. Are you polluting the ground water or a river? Is water too precious to flush? Better use a Dry Composting Toilet or Dehydrating Toilet ! 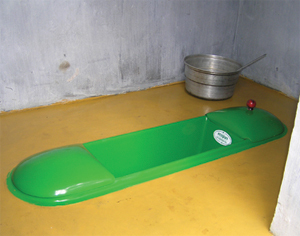 The original ecological toilet pan from eco-solutions. this is the solution to pollution !